www.DiverseTips.se: XenServer 6.0 släpps 23 september! denna sida dök upp idag. Vet inte som den verkligen är publik eller inte eftersom att jag inte hittar den på vanliga webb-siten. 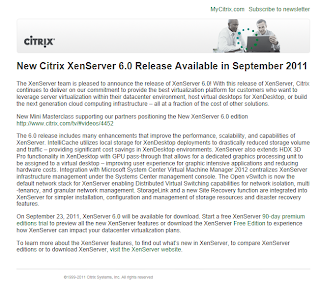 The XenServer team is pleased to announce the release of XenServer 6.0! With this release of XenServer, Citrix continues to deliver on our commitment to provide the best virtualization platform for customers who want to leverage server virtualization within their datacenter environment, host virtual desktops for XenDesktop, or build the next generation cloud computing infrastructure – all at a fraction of the cost of other solutions. The 6.0 release includes many enhancements that improve the performance, scalability, and capabilities of XenServer. IntelliCache utilizes local storage for XenDesktop deployments to drastically reduced storage volume and traffic – providing significant cost savings in XenDesktop environments. XenServer also extends HDX 3D Pro functionality in XenDesktop with GPU pass-through that allows for a dedicated graphics processing unit to be assigned to a virtual desktop – improving user experience for graphic intensive applications and reducing hardware costs. Integration with Microsoft System Center Virtual Machine Manager 2012 centralizes XenServer infrastructure management under the Systems Center management console. The Open vSwitch is now the default network stack for XenServer enabling Distributed Virtual Switching capabilities for network isolation, multi-tenancy, and granular network management. StorageLink and a new Site Recovery function are integrated into XenServer for simpler installation, configuration and management of storage resources and disaster recovery features. 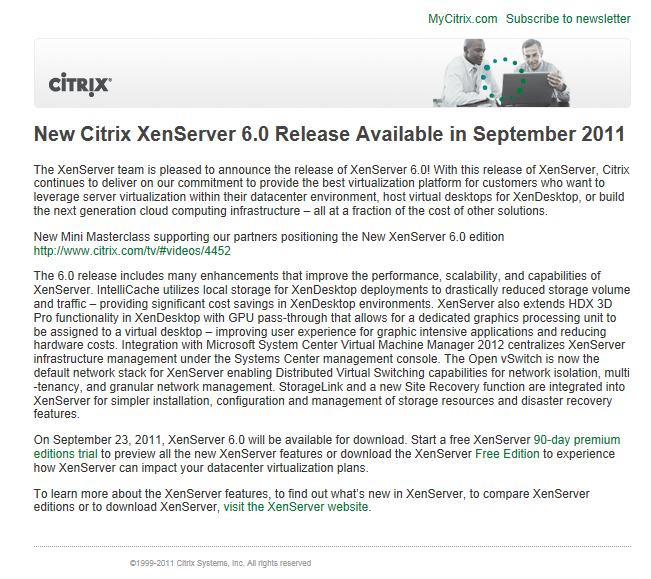 On September 23, 2011, XenServer 6.0 will be available for download. Start a free XenServer 90-day premium editions trial to preview all the new XenServer features or download the XenServer Free Edition to experience how XenServer can impact your datacenter virtualization plans. To learn more about the XenServer features, to find out what’s new in XenServer, to compare XenServer editions or to download XenServer, visit the XenServer website.